House Speaker Pantaleon Alvarez has instructed the members of the House of Representatives to turn over the special No. 8 plates issued to them during the previous Congresses. 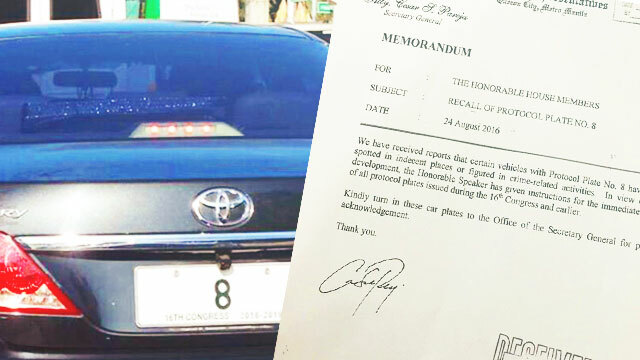 A memorandum cited various incidents where the special plates were possibly misused as the reason for the recall, the Inquirer reported. "We have received reports that certain vehicles with Protocol Plate No. 8 have been spotted in indecent places or figured in crime-related activities. In view of this development, the Honorable Speaker has given instructions for the immediate recall of all protocol plates issued during the 16th Congress and earlier," it read. GMA News reports that Navotas Rep. Toby Tiangco questions the move, saying it's only a partial recall of all the special plates issued to them. "Hindi naman namin kailangan ng 8 na plaka para magserbisyo sa ating mga kababayan. At kung talagang seryoso tungkol dito, ipasa ang panukalang batas ko na nagbabawal sa 8 na plaka, para may parusa sa mga gagamit pa nito," he said. In June, Tiangco filed a bill that bans the use of special No. 8 plates and penalizes violators with a P25,000 fine or up to six months of imprisonment. The recall was issued following an incident involving four vehicles all bearing the special No. 8 plate used in suspected cybersex operations in Pasay City in August.